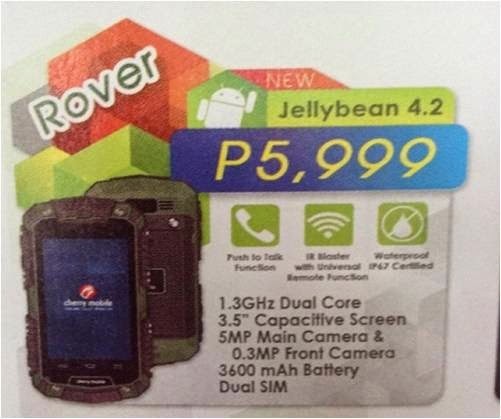 Cherry Mobile Rover is now officially added in the roster of the local company's unique smartphones. Once again, the local leader attempts to pitch a considerable market share by introducing a device for the active users. If you're mostly on the go or just trying to capture extreme moments with your device, the Rover would fit in your lifestyle. Just like the Samsung Galaxy S5, this device holds an IP67 on its belt. Among the device’s key features, what does the IP67 has to offer on the table? The IP67 certification is omnipresent in most of the flagship devices nowadays. Aside from the aforementioned Galaxy device, Sony's Xperia Z2 also hold this feather in its cap. IP Ratings or Ingress Protection ratings are used to classify the degree of proctection of a device against solid particles and liquids. The first number describes the degree of solid protection. In IP67, the number "6" means that the device is resistant against any solid intrusion, say dust for that matter. Second number "7" indicates that the device is water-proof atmost 1-meter depth within 30 minutes. Aside from the IP67, the device is powered by a 1.3-gigahertz dual-core CPU and Android Jelly Bean. You'll also get 5-megapixel rear shooter and dual-SIM capability right off the bat. Plus, the whopping 3600 mAh battery will keep you the road for a long time. Check out the rest of the specs below.